A question is actual for this group, how to distinguish from an imitation. Behaves to the group of feldspars and has obligatory inclusion scales of anhydroferrite and goethite (in potassium feldspar and oligoclase) and magnetite, rarer - to the native copper (in Labrador). Synonyms: Aventurine (field) spar, Aventurine Labrador, heliolite, sun stone. Glimmered ebb with green, goldish, red sparks. Scales glance (glitter, glare) on to light. Natural stone meet very rarely. All, that mass is for a sale in shops (golden-brown and black Aventurines with bright spangles), is a glass imitation with adding to molten mass of glass of oxides of copper, iron Fe, chrome and cobalt (photo on the right). Excessive plenty of spangles usually talks about an imitation. According to legend, in the sixteenth century venetian glass-blowers quite by chance got the glass imitation of this stone (Aventurines glass). Actually able to do adventurous glass yet ancient Egyptians and in India. Color of natural stone of white, light-grey, honey yellow, pink, rose, brick, cherry, green. The saturated colors are not uncommon, and spangles - yes. In shops green Aventurine acts sometimes under the guise of nephrite (by sight, distinguishing is difficult, but a nephrite does not contain spangles). In an order to distinguish Aventurine from other minerals, it is necessary to set the presence of shallow spangles and scales. 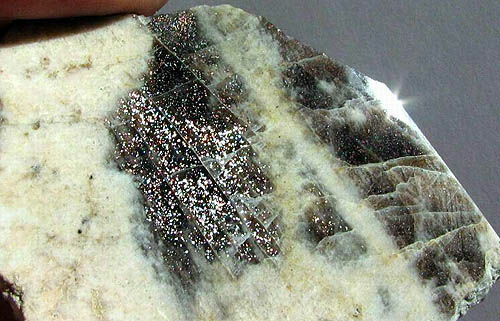 Sometimes mineral can show weak irisation. In Russia of 18-19 вв. the most beautiful standards of Aventurine were used for insertions in womanish decorations. From him did candlesticks, handles of forks, knives, vase, seal. Aventurine is painted usually in yellow, gold, green, brown, dark blue, cherry and black tones. Aventurine since olden times obtained in China, where he was named emperor's stone. 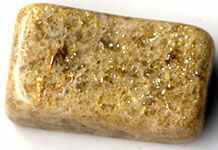 Standards of natural Aventurine can be and enough unattractive, and by luxurious overflowing multicoloured and glimmered gold sparks by minerals. 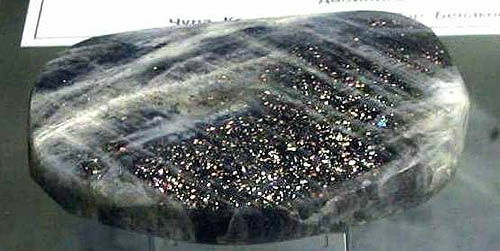 Sun stone or heliolite - it Microcline-perthites (feldspars), sanidine, oligoclase and albite, iridescent in goldish, yellow, red tones, that is conditioned microimpuritys in them anhydroferrite and goethite. 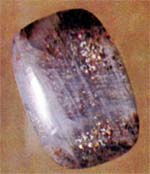 Opaque sun stone, Aventurine spar, more frequent used as carpentry stone. Jeweller, wares make also from transparent ferriorthoclase, ferrous sanidines with a goldish ebb. Their finds are present on Madagascar, in Mozambique, Russia and other Natural Aventurine today - very rare and dear carpentry stone. 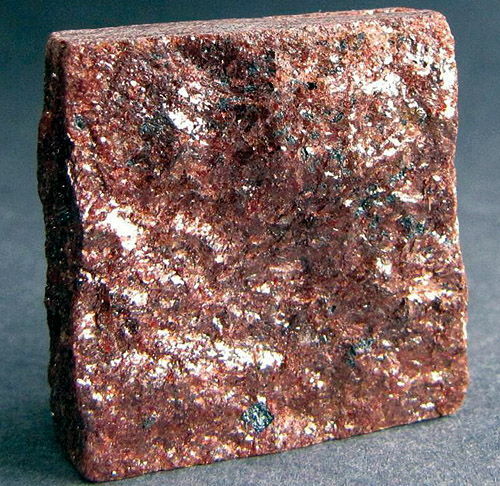 (due to including of anhydroferrite) and moonstone. Potanin of mountain, Ural, Russia. Photo: © A.A. Evseev. Aventurine. Taganay, Ural. Russia (Russian Federation, CIS). Photo: © A.A. Evseev. Aventurine is a talisman of love and passion, mystic revelations and unexpected acts and decisions. Talisman for the maintainance of glad mood. It gives a proprietor a depth and emotional cleanness. It is assumed that to Europe natural Aventurine left merchants by the Indian jewels, on own experience making sure in ability of this stone to attract success. Aventurine (especially quartz) clears ether, emotional and mental bodies and space round a proprietor. Gives a happy and glad mood, harmonizing a body and soul. 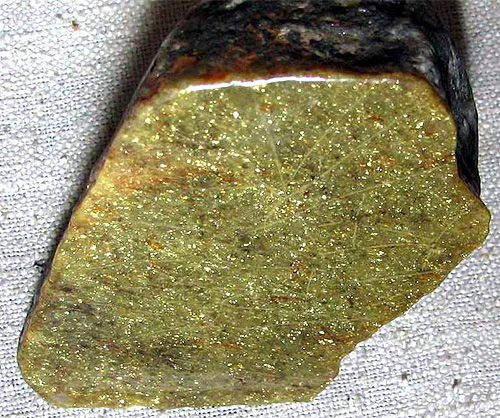 The modern researchers of Aventurine (feldspar) often wrong understand properties of this stone, binding him to crooked gambling and playing the stock market. Actually Aventurine is not so much with reckless games, how many with clean love. Intensifies all of emotions, doing them more thin, promotes optimism and confidence in itself, cheers up. Most favorable for people on which does not lie large responsibility, or for those, who wants to throw down the load of unnecessary responsibility, who is disturbed by the consciences of flashback and dream burdened torture torment, and also for children, yet not entering into independent life. Most imitations are today executed from glass of different quality with different additions (stone of Savrovski, glass strasses, black and gold yellow Aventurine, coloured Cat's Eye, suckling Moon stone, green Chrysoberyl, opaleglass and др). Natural stone meet very rarely. All, that mass is for a sale in shops, is a glass imitation with adding to molten mass of glass of oxides of copper, iron Fe, chrome and cobalt (photo on the right), actually painted glass with the brilliant including. Excessive plenty of spangles usually talks about an imitation. Historically Aventurine glass was invented independently in the different countries of the world. Color of natural stone of white, light-grey, honey yellow, pink, rose, brick, cherry, green. The saturated colors are not uncommon, and spangles - yes. In an order to distinguish Aventurine from other minerals, it is necessary to set the presence of shallow spangles and scales which usually poorly noticeable in natural stone. Sometimes natural mineral unlike synthetic materials can show weak irisation, while synthetic Aventurine simply can strongly glance (glitter, glare). In the glass imitation of scale sometimes can be disposed unevenly, observed areas of the painted glass with the lowered maintenance of spangles or in general without them. Most often there are glass imitations of golden-brown or jet-black color with plenty of bright and beautiful scales. It brightest Aventurine, natural often far paler.